Inanimate objects and cinema have never been the very best of friends. Despite attempts to personify them, some better than others (Ramin Bahrani’s 18 minute film about the epic, existential journey of a Plastic Bag – made human through the voice of Werner Herzog – has to be one of the few exceptions that prove the rule), there’s no getting away from the fact that they’re… well, inanimate (and therefore pretty much break every rule in the ‘good character’ guidebook). 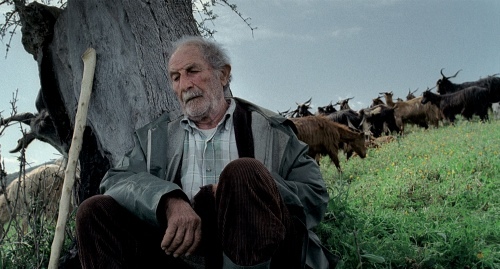 Michelangelo Frammartino’s Le Quattro Volte (The Four Times) challenges this dogmatic reliance on human character by blending man (in this case, shepherd) with animal, vegetable and mineral in the cycle of one soul moving through its four successive lives. The effect is surprisingly powerful. 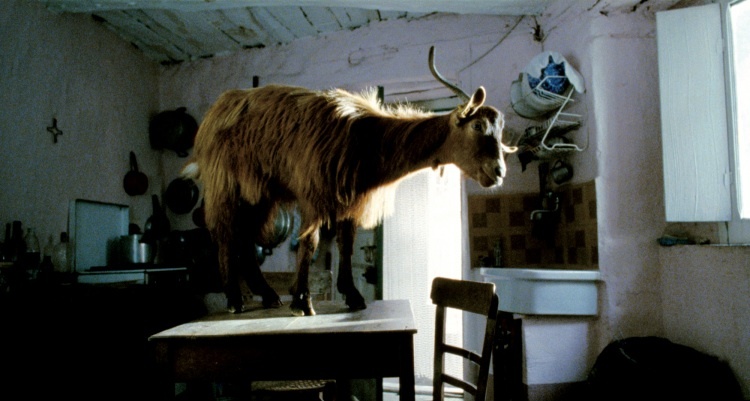 As the shepherd’s small and simple story of work, church, sleep and death – the film’s hook, if you could really call it that – gives way to the story of a goat, then a tree, and finally a kiln of charcoal, the dominance of nature over man feels completely (for want of a better word) natural – ideally suited to this style of ‘slow cinema’. In fact, slow cinema has never seemed so perfectly paced than this – a meditative pendulum that marks calm, reflective time. It’s the film’s simplicity – not only in story terms (of nature, of man, of small village life), but in form as well – that sits at the centre of its success. Elementary compositions, graded in an exquisite desaturated parma-violet, build a simple framework within which the story’s subjects are free to roam, and the wheels of the film’s multiple cycles (spiritual, industrial, natural) are left to spin. And by democratising everything that appears in front of the camera, the audience’s mind is also left free to roam, to make allusions, to meditate on the film’s themes (not least of which is the relative equality of all things found in nature: the ultimate humbler). Le Quattro Volte may, of course, be just one more exception (alongside Plastic Bag) to the rule. But with each exception, something somewhere in the cinematic soul (be it man, animal, vegetable or mineral) is stirring. And although they’ve never, as yet, been very good friends, inanimate objects and film might yet find a way to become best friends forever. 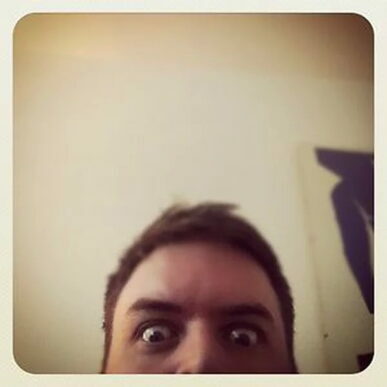 Great review – looking forward to seeing this even more now.